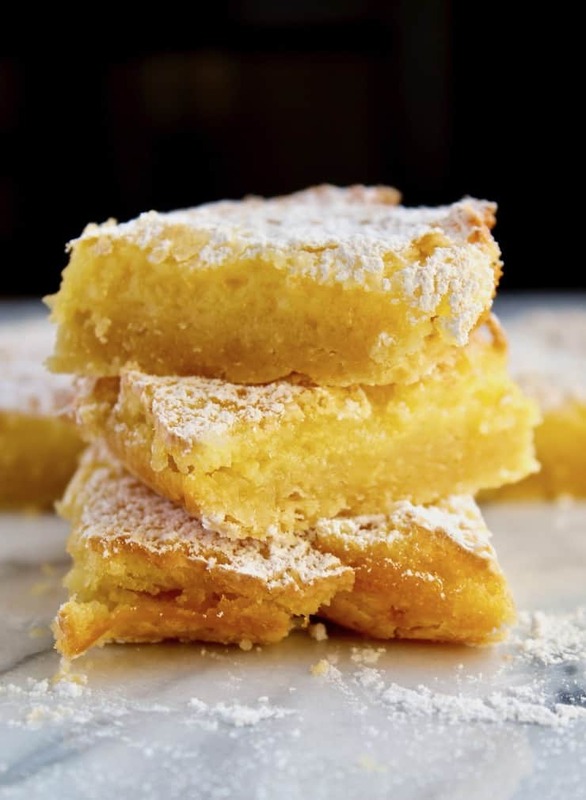 Lemon squares, luscious lemon bar recipe with a buttery shortbread crust topped with a tart, yet sweet, lemon filling. Spring is in the air very early this year. I think that’s what triggered my recent lemon bar craving. I have a recipe a friend gave me years ago that I made a few times and then kind of forgot about. 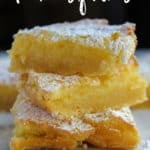 I remember Picky Eater loving these lemon squares but I just don’t think to whip up a batch. 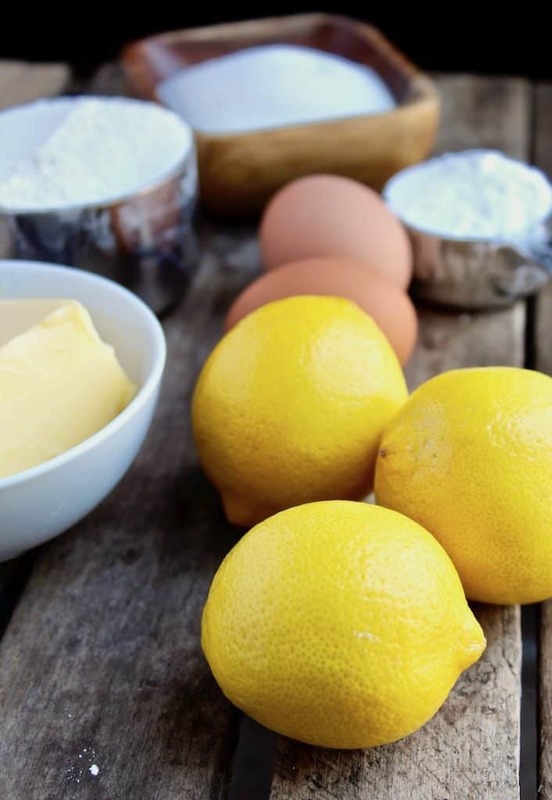 Not anymore ~ these homemade, fresh lemon squares are perfect and simple to make. 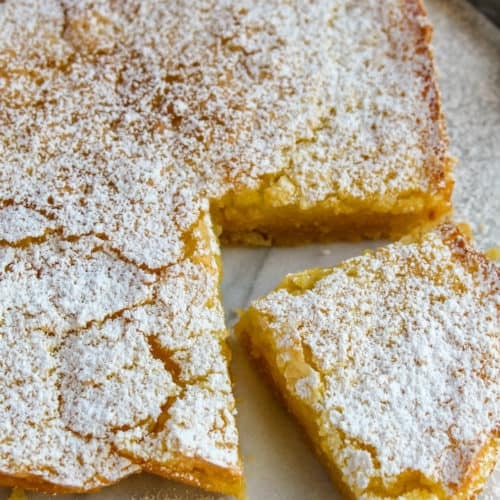 Here’s what I like about these lemon squares ~ the buttery shortbread-like thick crust and the sweet yet tart, but not too tart, lemon filling. I don’t like lemon bars so tart that they make you pucker. This creamy, lemony filling, really it’s a topping, is just right ~ sweet and lightly tart. I really, really love the buttery crust, so does Picky Eater. It’s a fairly substantial crust, not at all thin, and after it’s baked, the edges and bottom are perfectly crispy. It loses some of that crispness after storing the bars, but loses nothing in flavor. Besides, they don’t last long at all! Looking for more spring and summer desserts? You might like my Blackberry Crisp, Blackberry Peach Cobbler, Cherry Pie and Patriotic Fruit Pizza. 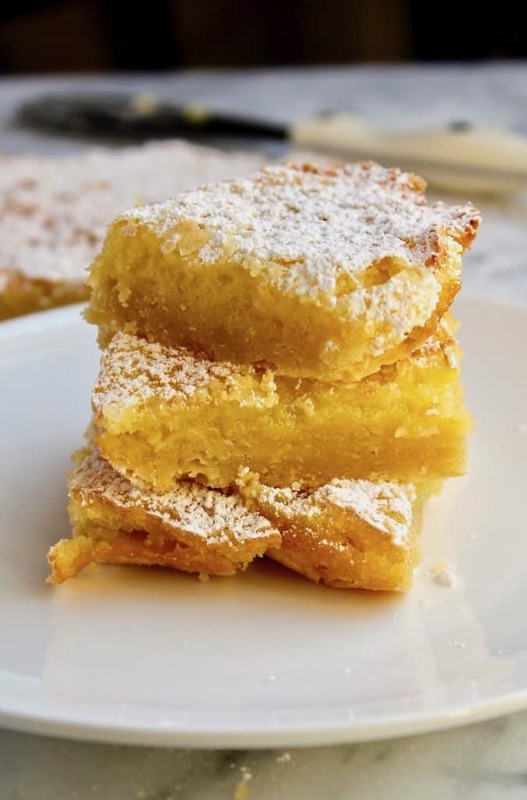 If you’ve tried these Lemon Squares, please rate them below in the comments and let me know how it went ~ I love hearing from you! HUNGRY FOR MORE? Subscribe to my Newsletter and come hang out with me on PINTEREST, INSTAGRAM and FACEBOOK for all the latest updates. 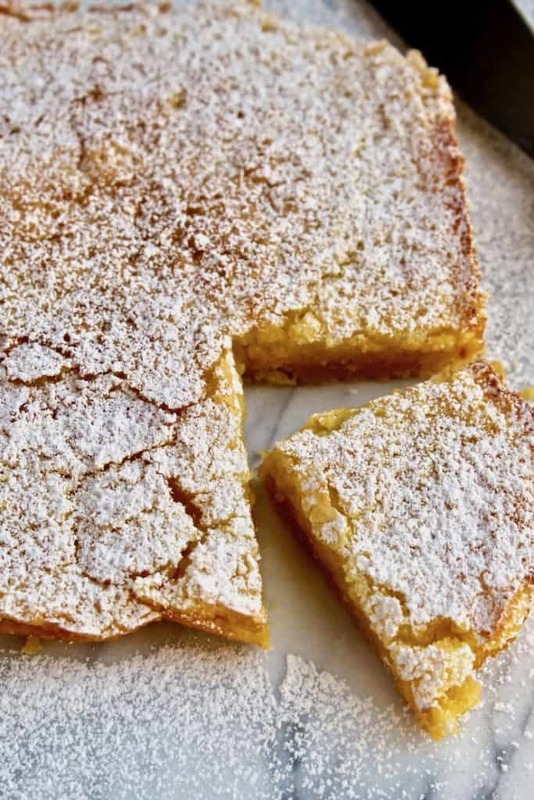 Luscious lemon squares with a buttery crust and sweet and lightly tart filling. Preheat oven to 350º. In medium bowl, combine flour, butter and powdered sugar with pastry cutter, wooden spoon or fingertips, until combined and holds together. Pat evenly into a foil-lined and lightly sprayed 8"x 8" baking dish. Bake for 20 minutes. Meanwhile, in another bowl, whisk together eggs, lemon juice, zest, sugar, 2T flour and baking powder until well combined. Pour over baked crust and bake in center of oven for 25 more minutes. Let cool on wire rack for 10 minutes or so, then gently pull out of pan by the aluminum foil edges. Carefully remove bars from foil and place on a cutting board. 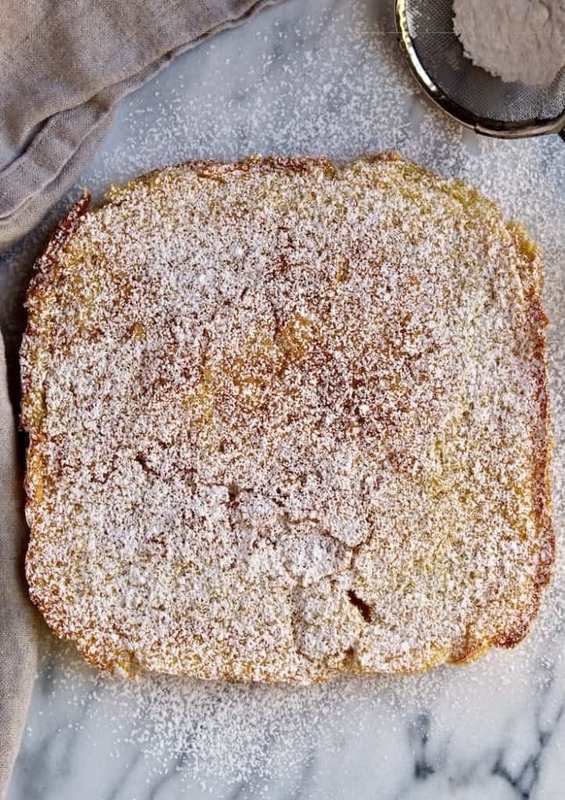 Dust with more powdered sugar and cut into bars, 12 to 16, depending on your size preference. Line baking dish with aluminum foil and lightly spray with vegetable oil baking spray. It will be much easier to remove the baked bars this way ~ they stick and are very delicate. I LOVE THIS! Great post. I think I’m going to have to make these for our potluck at work on Friday; I was told to bring the dessert. But I’m seriously craving these so bad right now! I can’t wait. This is the best recipe, Beth!